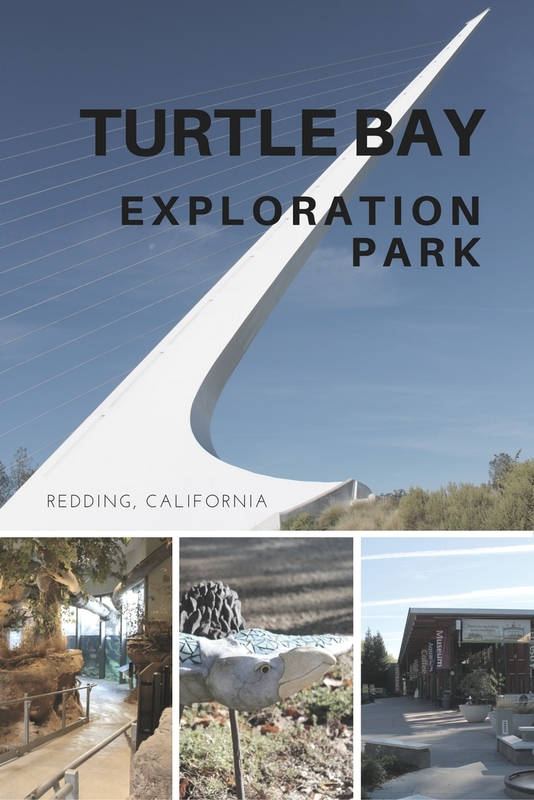 If you are passing through Redding, California on a family road trip, make sure and plan a stop at Turtle Bay Exploration Park. Turtle Bay is a 300-acre complex featuring a museum, botanical gardens and arboretum, and one of the world’s largest working sundials. As you enter Turtle Bay Exploration Park, the Turtle Bay Museum is located off to the right. Daily admission is $16 for adults, $12 for seniors and kids age 4-15, and free for kids 3 and under. The facility is closed on Monday and Tuesday, but the cafe and museum store are open seven days a week. 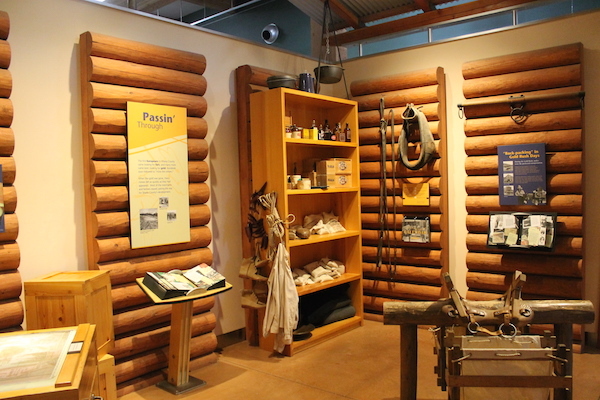 The museum features both permanent and interactive exhibits as well as two large “special exhibition” gallery rooms. Kids can view fish in the aquarium and river lab, walk into a Wintu bark house, crawl through the Shasta Caverns, and play with replica artifacts once used by the region’s early settlers. Many attractions are hands-on and encourage creative play. 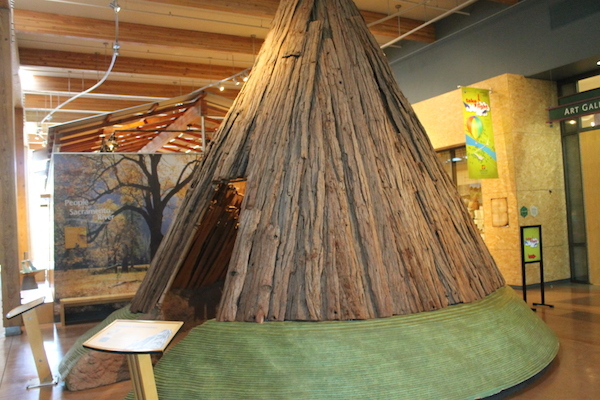 While the 34,000 square-foot Turtle Bay Museum is an excellent standalone experience, if you visit in nice weather make sure and leave an extra hour or two to fully explore the Paul Bunyan’s Forest Camp. 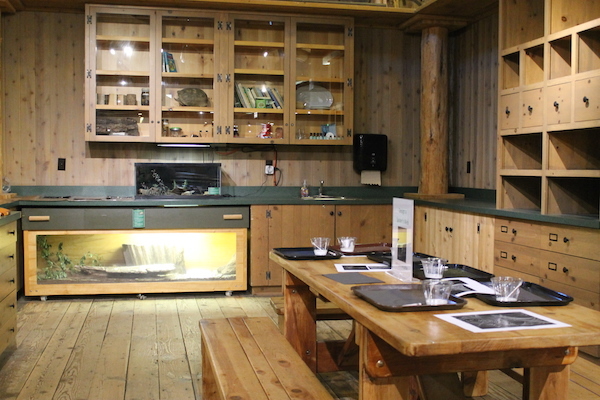 Modeled after an old-time forest camp, the exhibit is located mainly outdoors and in the large wooded area connected to the museum by an elevated boardwalk. Note: Until construction is complete on a new Sheraton Hotel, the only way into and out of the camp is through the main museum building. 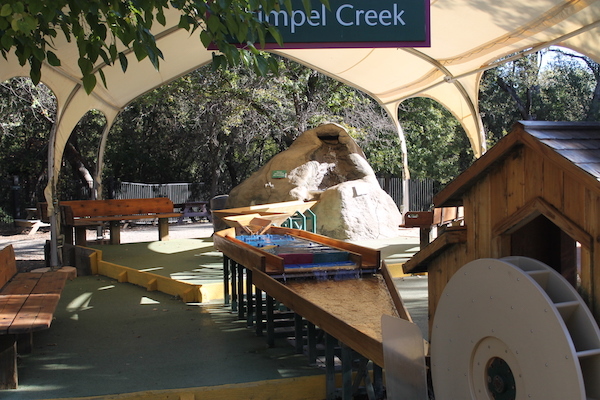 Start at the Stimple Creek Water Feature where kids will learn about the flow of water as it travels downstream, including various obstacles and a dam (not shown in the picture above). If your kids are anything like mine, they will probably get dirty and wet—there’s also a sand play area just to the left of the shaded benches. 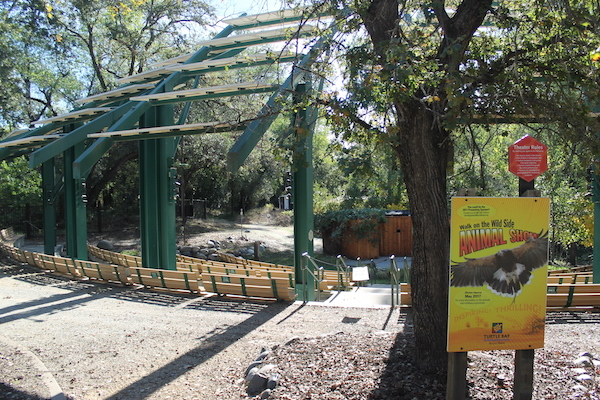 Tip: When you first arrive at the Museum, you may want to check the Animal Show schedule and plan to arrive at the outdoor amphitheater with plenty of time to find a seat. On the subject of cool animal experiences, a trip highlight is a visit to the Parrot Playhouse. 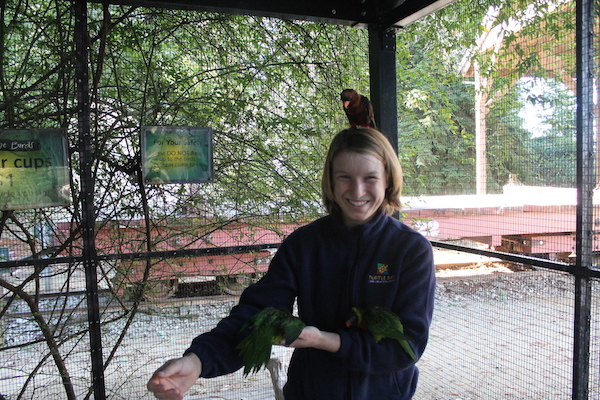 Inside the aviary exhibit, Australian lorikeets will likely land on your head and shoulders. Admission inside the aviary is free, but you can purchase cups of nectar for $1 (if you make this purchase, certainly expect to have multiple birds on your body at any given time). A nice option for pre-schoolers and elementary age kids is the space inside the Mill Building. I visited during story time, as a group of parents and children were learning about spiders. As I left, I noticed the craft table was set up with a project using glue and eight pieces of black string. Next, visitors are welcome to experience a self-guided walk through Wildlife Woods & Interpretive forest where they can see a variety of animals in a more natural habitat. Animals enclosures range from fox to bobcat, porcupine, and golden eagle. Unfortunately, some of the Paul Bunyan’s Forest Camp experience is enclosed, and closed, with the hotel construction. 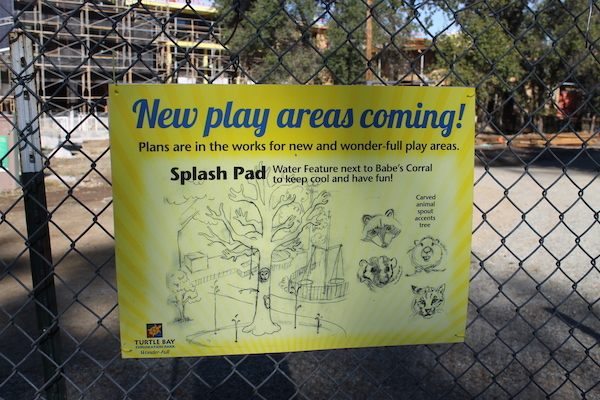 Future visitors will experience an enhanced play area complete with a splash pad water feature. 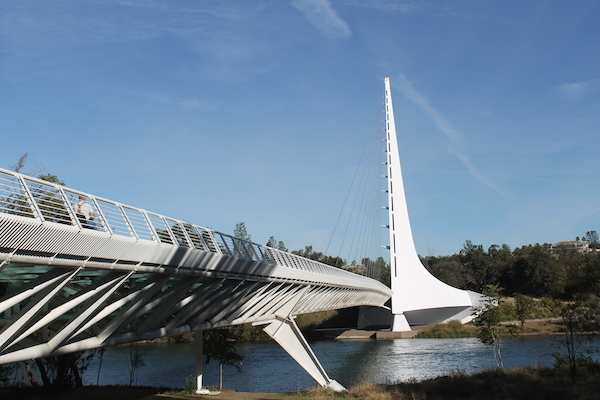 Back at the museum’s main entrance, you can’t miss Sundial Bridge, one of a handful of projects in the U.S. designed by acclaimed Spanish architect Santiago Calatrava. The glass decked, cable-stayed cantilever suspension bridge reaches 217 feet into the sky, spans 710 feet across the Sacramento River, and is one of the world’s largest working sundials. An interesting note is that the bridge was constructed without footings; a design that leaves the salmon habitat undisturbed. At night, the bridge’s glass deck is lit from below. I found the glass surface a bit slippery in the morning dew, but many people were happily crossing the bridge to walk/bike/jog the Sacramento River Trail and the network of paths meandering through the McConnell Arboretum & Botanical Gardens. 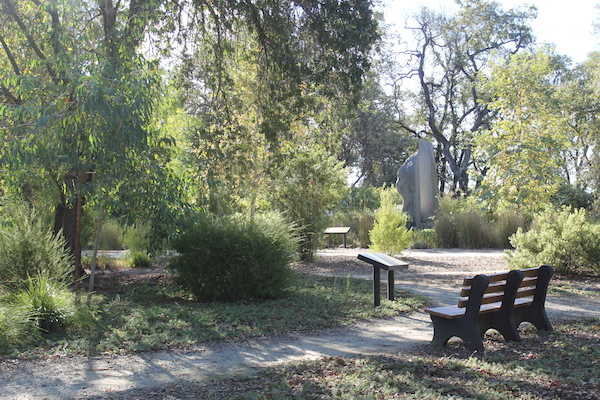 Across the Sacremento River from the Turtle Bay Museum, the McConnell Arboretum & Botanical Gardens offers residents and visitors a place to explore and experience plants specific to Mediterranean-climate zones, including California natives and ornamental grasses. Compact dirt trails flow through a variety of gardens including a Sounds of Water Fountain, a Chilean Garden, Butterfly Garden, and Native Urban Forest. A small Children’s Garden is located near the Mosaic Oasis Fountain; both are closer to the Nursery Entrance and parking lot along the west side of the property. Admission to the arboretum and botanical gardens is free, but a suggested donation of $4 is appreciated. Note: Many of the park’s locally-adapted perennials are available to purchase from the Nursery (open to the general public and located near the Nursery Office). For more information on planning your own trip to Turtle Bay and Redding, California, go to www.visitredding.com.